Trevor Bayne got his first victory in NASCAR’s Nationwide Series Saturday when he won at Texas Motor Speedway. Bayne passed Roush Fenway teammate Carl Edwards after a restart on lap 194 of 200 and held then held off Denny Hamlin for the win in the O’Reilly Auto Parts Challenge. It happened at Edwards’ expense. “The restart I was really happy Trevor was behind me and then he wasn’t behind me anymore after that and I was really happy that he was able to hold off the 18,” Edwards said, referring to Hamlin. “Our Fastenal Mustang was good all day. Towards the end we didn’t adjust our car as well, I don’t think, which is just as much my fault as anyone’s. Bayne crossed the finish line .142 seconds ahead of Hamlin, who started from the rear of the field after Kyle Busch, scheduled to drive the No. 18 Joe Gibbs Racing Toyota, was parked for the weekend for wrecking Ron Hornaday Jr. in Friday night’s truck series race. 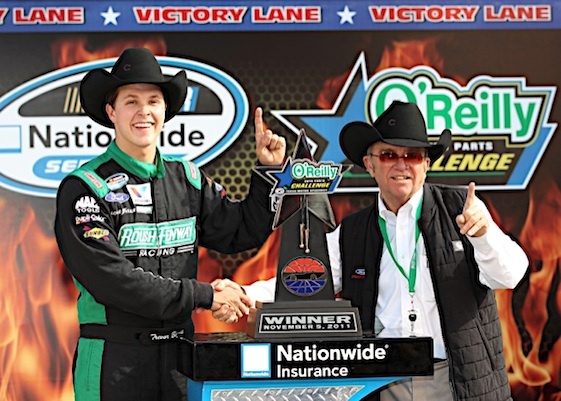 The victory helped Bayne update his wardrobe as he was presented with the traditional Texas cowboy hat in Victory Lane. Edwards dominated until the final caution flew on Lap 189. He finished third, followed by Clint Bowyer and Brad Keselowski. Series leader Ricky Stenhouse Jr. finished sixth and expanded his margin to 17 points over polesitter Elliott Sadler, who finished ninth. Danica Patrick ran 11th in her first Nationwide start since Oct. 8 at Kansas.